Ever wondered how exactly Starbucks concocts those cookie, caramel, and hazelnut-laden Frappuccinos? 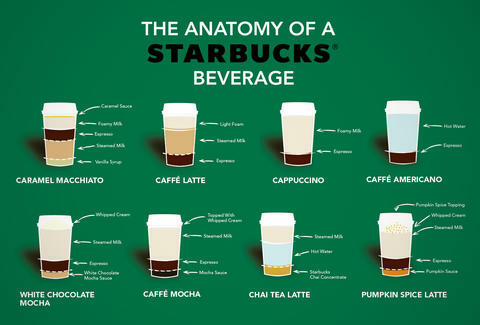 Keep on guessing, because we have no clue... but you can check out the scientific breakdown of 10 simpler drinks via this infographic below, which even reveals the sorcery behind the Pumpkin Spice Latte. It's all beautifully laid-out intel, though if you didn't already know what a cappuccino is made of, you probably don't like coffee very much. Kristin Hunt is a food/drink staff writer for Thrillist. She'll be meeting with her anonymous source in a parking lot later for that file on Frappuccinos. Follow her at @kristin_hunt.